We want to enable every student to receive quality graduate theological education. Thanks to funds provided by generous donors, our goal is to provide funding that recognizes academic excellence and/or financial need. All applications will be given serious consideration. For more information, contact Brian Cooper, Director of Student Development. We provide endowment awards made possible through the generosity of alumni, individual members of our MB constituency, and provincial conferences (e.g. R Epp Family, Nathan Paul Toews, ICOMB), based on financial need and the applicant’s potential for ministry in the church or missions. When an award is granted, the funds are divided between the Fall and Spring semester within the same academic year and applied directly to a student’s account. New and returning full-time students (9+ credit hours per semester) at our Langley or Winnipeg campuses will be given preference over part-time students (funds may be available for new and returning part-time students as well). Requests will be processed in the order in which they are received. A student must be enrolled in a degree program at MB Seminary in Langley or Winnipeg and maintain the required GPA applicable for their program (minimum 2.5). The Canadian Conference of MB Churches (CCMBC) partners with our MB churches to discern and develop new and emerging leaders. The CCMBC is committed to helping new leaders receive the education they need to succeed in ministry. The CCMBC and a student’s local church each provide 25% of the tuition and the student is responsible for the remaining 50% of their tuition costs. 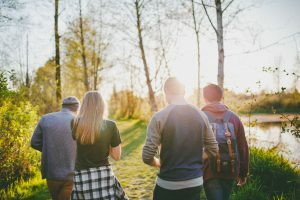 The LTMG applies to students enrolled in a degree program in Langley (ACTS Seminaries) or Winnipeg (Graduate School of Theology and Ministry at CMU). Applications will be processed in the week following these dates. Click here to learn more and to download the application forms. International students planning to study at MB Seminary can apply for financial assistance through ICOMB (International Community of Mennonite Brethren). The Global Scholarship Fund is designed to assist students in smaller or developing ICOMB churches to access higher learning. Click here to learn more. Financial aid is available for those who are members of an MB church in Saskatchewan. Email Brian Cooper, Director of Student Development, to learn if you are eligible to apply for this bursary. 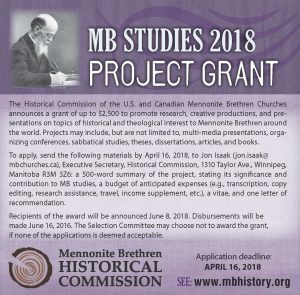 The MB Historical Commission provides opportunities each year to receive grant money for projects and research. Summer internship and stipends for writing articles are also made available. You can learn more by visiting the MB Historical Commission website.